It’s almost a Pavlovian response for me; the calendar flips to June and I start to crave fried clams and lobster rolls. My favorite fried clams are at the Clam Box in Ipswich, but driving an hour in an unair-conditioned car was not appealing. After surviving the heat wave, I wanted to fully enjoy Monday’s cooler weather with some al fresco dining. Tony’s Clam Shop was exactly what I had in mind. The traffic had died down, so it was a zippy ride to Quincy by 8pm. 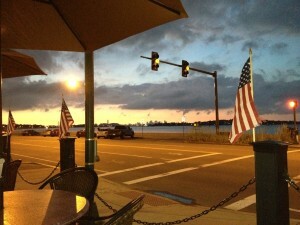 Tony’s is across the street from Wollaston Beach and has outdoor seating, so that you can enjoy the view as you munch. Tony’s is very causal; you order at the counter and they give you the cutest lobster-shaped pager to alert you when your food is ready. Plastic trays and paper plates abound. 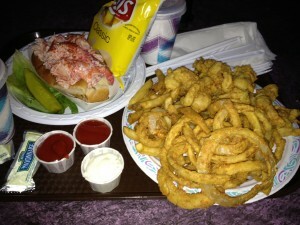 My dining companion and I shared a fried whole clam plate ($19) and a lobster roll ($19). I was able to get ½ fries and ½ onion rings with the plate, which always makes me happy. The clams were large, briny and juicy. The breading was similar to the Clam Box and not overly greasy. I think they could have been more flavorful, but I was still happy. The fries and onion rings were excellent; they stayed crispy even after they cooled. The lobster roll was mayo based, no fillers (celery, lettuce) and generously overflowing with meat. They toasted the bun, which is a must. The lobster had a nice firm texture, but like the clams, lacked a little in flavor. The ambiance was perfect – we sat on the patio, watching the sunset while enjoying the warm breeze. I couldn’t have asked for a more perfect start to the fried clam eating season, er, I mean summer.